Say hello to our new line of oil absorbent products! 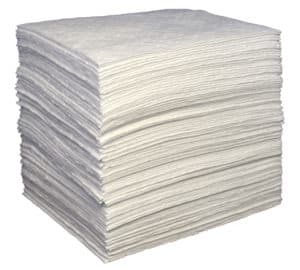 In the past, we’ve carried a limited selection of oil absorbent pads that were available with bulk discount pricing, by the pallet. The products were fairly popular. So when we met our new supplier, we were excited to learn about the new categories of oil absorbents we could carry, as well as the better pricing we would be able to offer. Oil-Only Pads – This category now has a wider selection of white absorbents. They start out with our newest Meltblown pads which are the cheapest, available for $822.15 per pallet of 42 medium weight bails. We also added bonded and laminated pads to this category. Universal, Booms, and Rolls categories all have new offerings as well. Oil absorbent pillows is a completely new category of absorbents that we have not carried before. Yellow Hazmat Absorbents are also new. These absorbents are designed for hazardous materials and safety conscious customers who want the extra level of assurance that their cleanups will be handled properly. Spill Kits are a new category that has become popular recently because they provide all of the tools organizations need to contain and clean up hazardous messes. Our Specialty Absorbents category has a selection of all new and hard to find products like static dissipative absorbent pads, green pads that are formulated to absorb glycol better than universal pads, as well as industrial roll absorbent mats. We think you will find our new line of products very extensive and of high quality. We know that we have some of the best pricing in the market for these products. Thank you for visiting Worldwide Janitor. This entry was posted in Marine Applications, News, Oil & Gas Industry, Uncategorized and tagged Hazmat Yellow Oil Absorbent, Oil Absorbent Booms, Oil Absorbent Pads, Oil Absorbent Rolls, Spill Kit. Bookmark the permalink.